The fit is perfect throughout. I was having a hard time deciding which cardigan to pair with the dress. At the end, I decided to pair this dress with a different shade of blue. It may not be the best option but I think it’s not too bad, either. What do you think? Does it work? It was raining all weekend long. I stayed in for the most part except went out to dinner with my family for my brother's birthdy. I had a pretty productive weekend. I got 3 set of income taxes done. One for us, one for my parents and one for a friend. Whew!﻿ The only thing that I didn't have time to do is book a vacation for us. Work has been crazy for the past 6 months. We're in need of a long overdue vacation. You look so pretty in this dress, Sydney. I love the fit on you. Is it that warm already in OH? Absolutely classy and beautiful! This colour is gorgeous on you Sydney! Blue is my favorite color, so I can really appreciate the blue dress here. I am okay with the lighter blue cardigan to go over the somewhat sky blue patterned dress. It is a lovely look. Or in other terms, you're as beautifully blue as the sunny blue skies in these pictures. Aww, you look ADORABLE. So classy. pretty pretty!! you look great in blue, sydney! i think it works with the blue cardi. the dress fits you perfect. it's been raining here too!! i guess you can't escape the rain. I love the pretty blue color of this dress and think the blue cardigan really works with it! I really like the gray coat and think a gray cardigan would be really nice too. And kudos to you for getting 3 sets of income taxes done! Wow you look amazing in blue, Sydney! The cardigan & the dress go really well together. You look great in this dress! I think most colors would work well with blue, so you could stay conservative with whites or blacks, or even go a little crazy with yellow. Have a good week, Sydney! I really like the two different blue tones paired together, quite lovely! Your outfit is SO PRETTY! It's gotten really nice here in CT too yesterday and while today we got a ton of rain I am optimistic spring is just around the corner. I really like the blue skirt on you! I love the blue on blue - it definitely works!! And the fit of the dress on you is so perfect - glad you were able to find a 00P! Good for you for getting your taxes done! I need to print out a few more docs before we send it off to the accountant. Pretty dress and pretty you! The color and pattern are simply gorgeous. It is lovely with or without a cardigan/a coate. Great buy. @Vicky There were a couple of sunny days last week but it's still not that warm. @kileen, @Cee Thank you both! I am going to try this dress with the colors you girls suggested. @swanprincess I still have the tag at home. I will put it up tonight for your reference. Thanks for stopping by. Loving the dress! I can't get enough of bright blues right now :). i like the print of this dress. Oh you look so pretty in this dress! I returned mine :( Thanks for the link!!! Wow, I LOVE this dress! And I think pairing it with a different shade of blue was genius! You look amazing! You look so sophisticated! Blue was still a great choice. I think black would have been a little too predicted and I'm glad you chose blue. That coat is really gorgeous...I can't believe it is under $40?! Gorgeous!! I think the blue cardigan works well! You could even use a soft grey cardigan, and wear some chunky silver jewelry to tie in the color more. So pretty! love the print on the dress, blue definitely looks precious on you. Gorgeous! Love how you styled the whole thing! that dress is FANTASTICC!!!! lovin it!!!! I accidently stumbled on this blog because I googled 'petite dresses' (very petite myself). Somehow I made it here haha! That dress is gorgeous, seriously I am going to hit the outlets near me just to see if maybe they still have one left. :) Love the combo of the lighter blue with the blue, uber classy. 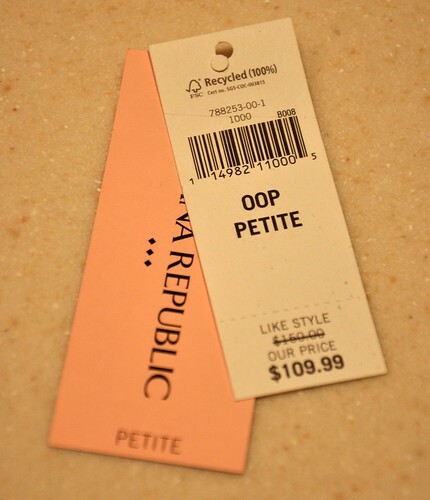 Thanks for blogging about your 'petiteness', it makes me feel better I'm not the only one on a constant clothes search! I love this dress on you!! And I'm a fan of the blue cardigan too... I like pairing different shades of the same color ever since I saw one of Kelly's posts.